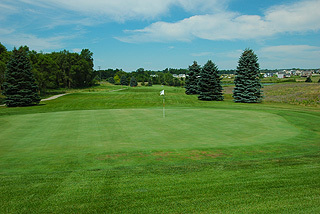 Boulder Creek Golf Club in Belmont just northeast of Grand Rapids is a Mark DeVries 4 star design (Golf Digest) featuring diverse terrain and wonderful conditioning and exquisite landscaping from tee to green. 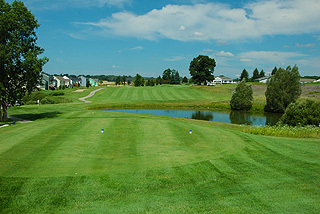 This player friendly layout offers ample fairways and mildly undulating greens which generally provide plentiful room for error. Those who can master bump and run approaches and chips will find success in getting up and down from shots landing short of the putting surfaces. Water comes into play on just 5 holes and there are around 40 sand bunkers on the course, but tricky doglegs and elevation changes will challenge even the best golfers to display their "A" game. There is a nice mix of fairly open and tight tree lined fairways, affording golfers an opportunity to play a variety of clubs off the tee. 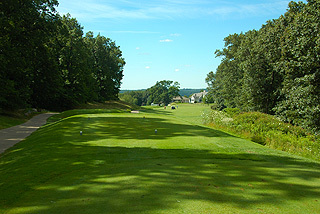 Five sets of tees are fairly evenly interspersed, with the tips playing to 6949 yards with a 131 slope. The blues measure 6387/128 slope and the whites 6007 yards with a slope of 121. Women will find two choices with the gold tees playing to 5529/122 slope and the red tees measuring 4949 yards with a 117 slope rating. 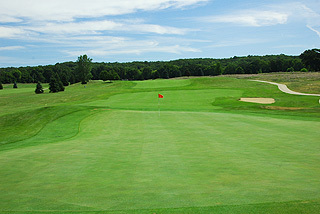 As the slope s indicate - this course is playable for all levels of golfers. Landscaping throughout the layout - especially near the tee areas, provides an extra touch, though none is really needed. 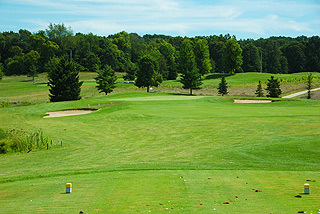 The golf course is simple but beautiful, with manicured playing surfaces and a nice variety in topography. The par five 15th with a water hazard situated along the right side, and the par three 16th are particularly beautiful golf holes. 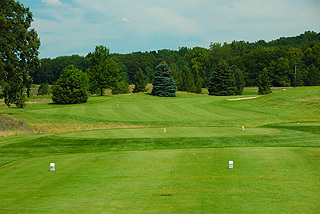 On course golfers will find that 150 yard stakes are positioned on all par fours and fives. The tee boxes on all par threes are marked, and red, white and blue flags indicate the day's hole locations. 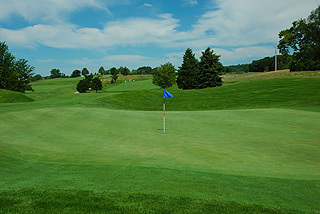 Practice facilities include a spacious grass range, huge putting green and a short game area with practice bunker. Together with the beautiful clubhouse, these facilities are worthy of recognition with the state's top upscale golf properties.. The clubhouse - which forms a perfect backdrop for the ninth and eighteenth holes, includes a full service pro shop , restaurant/lounge with an extensive lunch and dinner menu, and locker rooms with showers for men and women. Throw in a finely appointed outdoor patio, and banquet facilities for 200 people, and Boulder Creek is a perfect place for outings and special events. This is a no-brainer.. great rates, wonderful course, top notch facilities, friendly people - we highly recommend a round here. It is easy enough to get to, just 20 - 25 minutes from Grand Rapids. 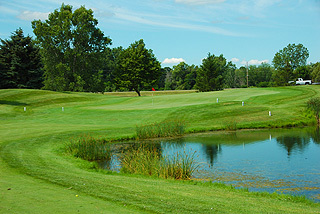 For a map & directions and for more information on Boulder Creek, visit our page for them (with link to their website) on our West Michigan web catalog of courses to play by clicking here.